Black Revolutionary War Hero Edward 'Ned' Hector Program And Open House - February 1, 2015 ~ The History Girl! On Sunday, February 1 from 1:00 - 4:00 pm, the Friends of the Jacobus Vanderveer House will host an open house and a presentation, beginning at 2:00 pm, about Edward 'Ned' Hector, a free African- American soldier who fought on behalf of the Patriots in the American Revolution. Hector will be portrayed by Noah Lewis, of Upper Darby, PA, author of Hector's biography, Edward 'Ned' Hector - Revolutionary War Hero. Lewis, dressed in the uniform of the Third Pennsylvania Artillery Company, offers captivating insight about the role of African Americans in the Colonial fight for freedom during his highly interactive presentation, including instructions (with audience participation) on how to fire a cannon. For nearly two decades, his first-person interpretation has been lauded by elementary and middle school teachers, who have invited him into their classrooms to bring Revolutionary War lessons to life. 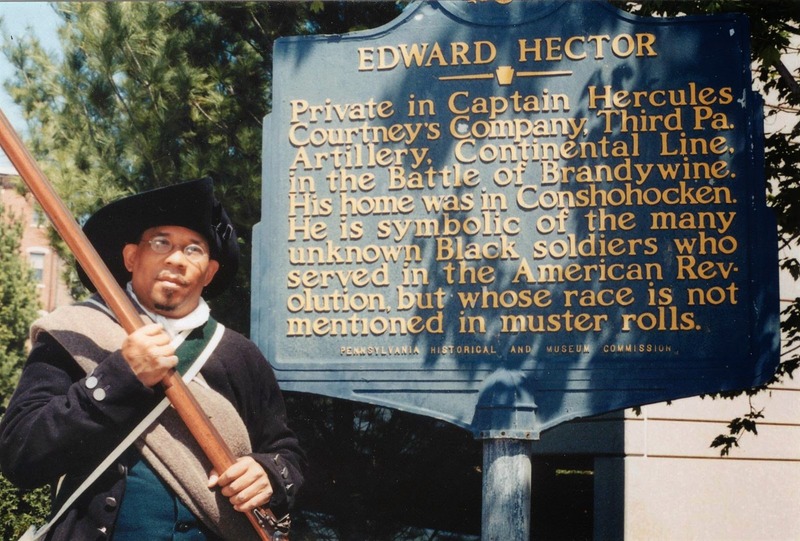 Edward 'Ned' Hector (born about 1744) was one of the 3,000-5,000 African-American soldiers who fought for the cause of American Independence in the Revolutionary War. He served as a teamster (a wagon driver) and a bombardier (part of an artillery crew) with the state militia called Proctor's Third Pennsylvania Artillery, which, by the end of 1777, became the Fourth Continental Artillery. He participated in the Battle of Brandywine (September 11, 1777) and Germantown (October 4, 1777). During the Battle of Brandywine, Hector disregarded orders to abandon everything and retreat. He is, subsequently, best known for his reply, "The enemy shall not have my team; I will save my horses and myself!" The open house tour of the Jacobus Vanderveer House is free, but admission to the Ned Hector presentation is $10 per person (members of The Jacobus Vanderveer House are admitted free and given priority seating). For reservations and information about membership and other upcoming events, visit www.jvanderveerhouse.org or call 908-396-6053. The Jacobus Vanderveer House is located at 3055 River Road East (in Bedminster's River Road Park), Bedminster, NJ 07921.